Aiken, South Carolina (August 22, 2016) – Aiken Land Conservancy (ALC) announced it has achieved accreditation – a mark of distinction in land conservation. The Land Trust Accreditation Commission awarded accreditation, signifying its confidence that ALC’s lands will be protected forever. “Achieving accreditation as a land trust provides an essential tool to attract the resources for a future in which land conservation will be increasingly critical to protect and enhance our quality of life,” said Larry Comegys, ALC President. ALC was among 38 land trusts across the United States to achieve accreditation or to have accreditation renewed in August. ALC joins the more than 350 accredited land trusts that demonstrate their commitment to professional excellence through accreditation, helping to maintain the public’s trust in their work. ALC has many reasons to celebrate. Along with achieving accreditation, the organization just celebrated its 25th anniversary. The founding trustees had the courage, vision and energy to create an organization with a mission to preserve and protect the quality of life in the Aiken community. ALC has protected nearly 40 properties in Aiken County and cultivated a reputation for being good stewards in the management of their land. ALC’s portfolio of properties is diverse, ranging from small pieces of land in Aiken’s historic horse district to large working farms on the edge of the county. All of them share a significant role in ALC’s goals as a conservation organization – whether it be to secure a piece of green space in an urban neighborhood, preserve the historic use of a parcel slated for development, or ensure the continued careful stewardship of a beloved family farm. One of ALC’s most prized properties is Winthrop Polo Field, a 12-acre jewel in the center of the historic horse district. In the early 1990’s this piece of land was threatened by imminent development, and ALC spearheaded a campaign to save it. ALC takes great care in maintaining and preserving this property for public use; the field is enjoyed regularly by equestrians exercising their horses, folks practicing maneuvers with their classic “4 in hand” carriages, people walking their dogs and neighbors out for a stroll. Each accredited land trusts meets extensive documentation requirements and undergoes a comprehensive review as part of its accreditation application. The process is rigorous and strengthens land trusts so they can help landowners and communities achieve their goals. 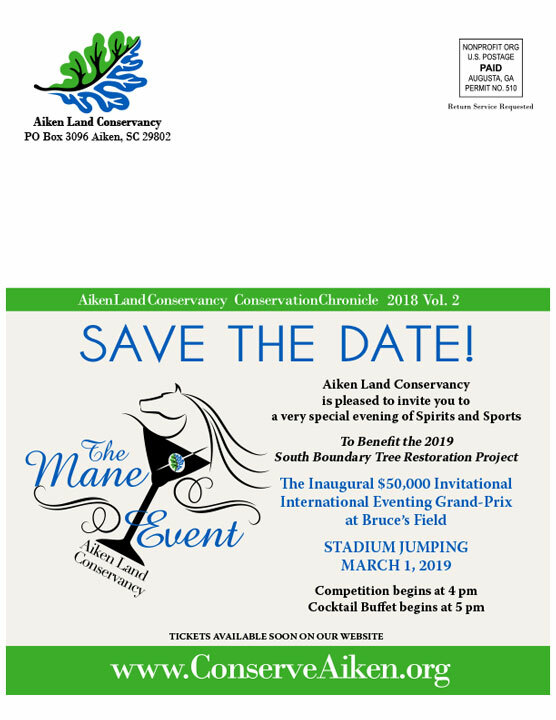 Founded in 1991, Aiken Land Conservancy is a 501 (c)3 organization dedicated to protecting open land, preserving the character of Aiken County, fostering the use of sound conservation practices, and encouraging land use planning for the long term benefit of Aiken citizens. Since 1991, ALC has preserved thousands of acres of land throughout Aiken and Barnwell Counties. These tracts of land include agricultural and forest lands, lands of educational and historic value, fragile ecological sites and watersheds. ALC is a member of the South Carolina Land Trust Network and the Land Trust Alliance.